The death and grind standard bearers have promised another historic set which will feature cult classics alongside unexpected old gems and brand new material when they take the stage at Leeds University Union on Saturday, November 2, 2013. And after helping to sell out Damnation Festival in advance back in 2008, guitarist Bill Steer is looking forward to performing to a packed house on their return to the event. He said: “We’re very excited about the prospect of returning to Damnation Festival this year. “Our appearance there in 2008 was a major highlight for us and this time around, people can expect to hear a fairly different Carcass set. With 22 more bands to be announced across three stages, festival director Gavin McInally, said fans can look forward to the melting pot of diverse styles of music Damnation Festival is known for from black metal to post-rock. He added: “It was a coup to land the first UK Carcass show in 13 years in 2008 when fans snapped up every ticket going before we made it to the day itself and it’s another coup having the band return following the release of their first new album in 17 years. 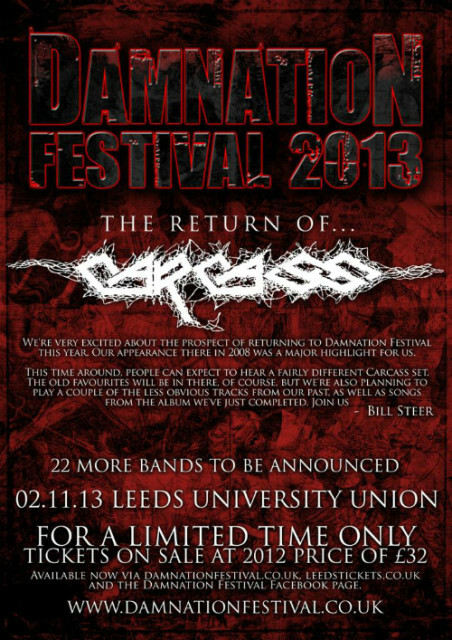 Tickets for Damnation Festival 2013 are on sale now and will be held at last year’s price of £32 for a limited period. To buy tickets, visit http://www.leedstickets.co.uk , the official Damnation Festival website at http://www.damnationfestival.co.uk or facebook.com/damnationfestival.